Last year, executives for Mylan, the Pittsburgh-based generic drug maker, took the company’s two corporate jets on hundreds of flights to vacation hotspots such as Las Vegas, Miami, and the California wine country. The worst offender was CEO Bob Coury, who racked up $535,590 in personal jet flights on the company dime. Of course, Coury’s air travel perk pales in comparison to his overall pay package of $23 million, which included a big raise pegged to a 15 percent bump in the company’s share price. As long as Mylan rakes in profits, should shareholders care that its execs expense a few fun-filled weekend getaways? The short answer is yes, according to a new report from GorvernanceMetrics International, a corporate oversight consultancy. Lavish spending on corporate jets rarely theatens to break a company on its own, but “if you’re looking for a red flag to provoke a wider look at a company’s governance and accounting practices, unusually high corporate jet perks is usually a pretty good one,” the report says. 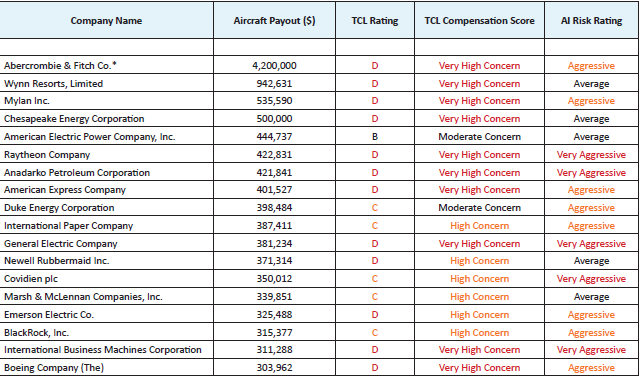 Among the Fortune 500 companies that doled out CEO jet perks last year, the top 10 percent of spenders, or 18 companies, all ranked worse than average on one or more measures of shareholder risk or excessive corporate pay. Mylan, which also makes the EpiPen cure for severe allergic reactions, earned a “very high concern” rating from the Corporate Library executive pay consultancy and an “agressive” rating from Audit Integrity, which flags risks such as SEC violations. Mylan spent six times more on personal flights for its CEO than did larger drugmakers such as Johnson & Johnson and Pfizer. Only two other companies, Abercrombie & Fitch and the Wynn Resorts, shelled out more than Mylan on corporate jets last year. “If a board can’t say “no” to a CEO’s request that the company pay for his or her vacation, or taxes, or tax advice (to list just a few examples), that board may not be exercising very strong oversight of CEO performance,” the report concludes. In other words, corporate directors who can’t keep their execs out of the honey pot are liable to get stung. And in Mylan’s case, an EpiPen probably won’t save them.